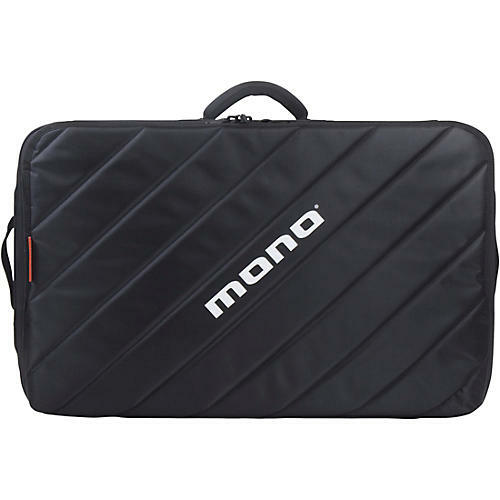 Make your rig truly portable with the MONO 2.0 Pedalboard bag range. It features the same quality, finish and design as the original MONO 1.0 cases, but reformatted to be a better fit for today's pedalboard sizes, as well as other music equipment. Rock-solid, industrial webbing handles come standard on MONO cases. Bar-tack stitching and steel rivets reinforce for strength, while high grade webbing provides a super comfortable grip. The removable memory foam shoulder strap lightens the load. Rugged interior liners with plush top panels to protect knobs and switches. Plastic reinforced hybrid shells shave off pounds of weight. And all MONO cases are covered under Lifetime Warranty. The Tour 2.0 Pedalboard Bag is sized to fit the Medium pedalboard by MONO, but will fit other similar pedalboards as well. Internal case dimensions: 24 x 14.5 x 5.5 in.